A UNIVERSITY of Hawaii professor has won custody of a unique laser that was the subject of a nine-year ownership fight with Duke University. More than 1,000 pieces, shipped here in two large containers, are being assembled in a Free Electron Laser Lab behind Watanabe Hall. John Madey, UH professor of physics and astronomy, who invented and owns the equipment, said a confidential settlement was reached with Duke last April. Relieved to have his laser back, he said in an interview, "You don't appreciate how great (it is) until after you no longer lose sleep over it." 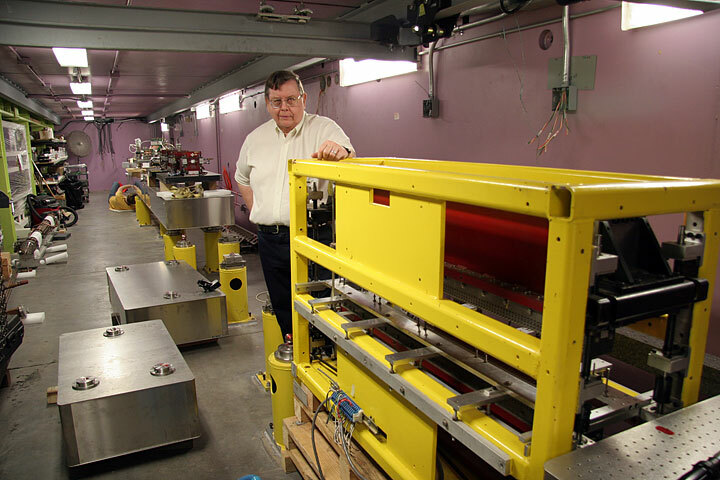 Madey developed the powerful free-electron laser when he was a graduate student at the California Institute of Technology in the 1970s and later at Stanford University. It uses moving electrons to produce beams of intense infrared light that can be tuned at a wide range of wavelengths for uses ranging from brain surgery to detection of clandestine nuclear and chemical weapons. Duke recruited Madey from Stanford, and he ran a Duke Free Electron Laser Laboratory there from 1989 to 1997, when administrators removed him as director. Duke took over the lab, alleging Madey managed it poorly and left equipment dormant that others wanted to use. Madey said Duke wanted to use the laser for research by other faculty members that violated terms of limits set by his government funding. He came to UH in August 1998 and sued Duke, claiming it had violated his patents on the laser. The Office of Naval Research and U.S. Department of Energy were drawn into the conflict. Duke said ONR concluded that Duke owned the laser, but the Energy Department, which helped pay for its development, disagreed. Terms of the settlement weren't disclosed or discussed by the parties. But Madey noted, "Gov. (Linda) Lingle's office was very helpful in facilitating the settlement. She and her staff deserve a lot of credit for bringing this about." Randall Roden of Tharrington Smith in Raleigh, N.C., the attorney who represented Madey, said in an e-mail that all claims had been settled and the case dismissed "only after a federal judge denied Duke's motions for summary judgment, setting the stage for a jury trial on multiple claims, including constructive fraud and punitive damages." Madey's research was significantly delayed by the dispute, Roden added. Madey said, "Our focus is on sensor systems primarily related to defense applications, but with applications also in medical diagnostics for clinical and research applications for pharmaceuticals, process control in industry and environmental uses." He said he and his colleagues had made progress in understanding atoms and molecules they're looking for and the basic approach in their detection. "Where we've been stymied is the ability to carry out demonstration and proof-of-principle experiments that you need to establish that the approach is valid," he said. "Frankly, we wish we had the hardware three years ago, because we would have been ready to begin those experiments at that time." Working with Madey have been UH researchers Shiv Sharma, Pui Lam, Teng Chen and Eric Szarmes. He said they're "grateful we have the capability (with the high-powered laser) to move forward with proof-of-principle demonstrations." 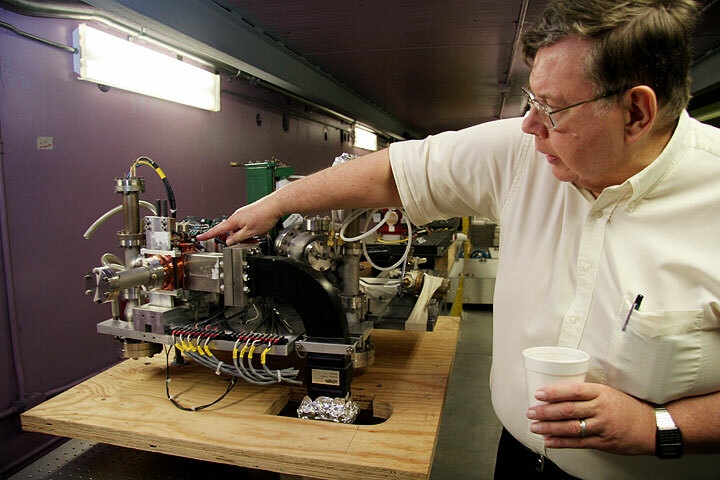 Madey's program began in 2000 with $5.4 million from the Nuclear Treaty Program, administered by the Army Space and Missile Command at Huntsville, Ala.
His team was awarded $49 million in 2002 for five years to conduct basic research on a sensing system and a number of options. After joining UH, where he had been collaborating with other scientists, Madey built a Free Electron Laser Lab behind Watanabe Hall and hopes to have it in full operation in March. "When you make a move like this, there are many steps to re-establishing capability, starting with creation of the facility," he said. As part of the goal to detect clandestine nuclear testing, Madey planned portable laser units for the Pacific Missile Range Facility at Barking Sands, Kauai, and Haleakala, Maui. "That remains to be determined," he said, based on experiments that must be performed once his laser is operating.